At the very minimum, you at least thought about what plants you wanted for your landscaping. What type of grass, shrubs, and ornamentals would work for your space? More likely, you worked with a landscape designer or architect to craft the perfect landscape for your home. You’ll want to do the same for your landscape lighting. Don’t throw it all away with a few randomly placed solar lights. So, before you start buying lights, think about what you want to achieve. Are there certain trees or features you want to highlight at night? Do you have an outdoor space that you would like to illuminate? Are there paths that need to be lit? Are there security issues to think about? And, how will your lighting look when you return home in the evening? Landscape lighting designs can make a dramatic difference in your home’s appearance. It is important to plan your goals and objectives for this project. Another aspect to consider is, are you willing to do the work yourself? While lighting kits are available, a landscape company can help you refine your vision for outdoor lighting. You want your lighting to work for you, so make sure you take the time to get it right. Now that you’ve committed to adding landscape lighting, it’s time to think about the different types available. Most homeowners will typically opt for low-voltage lighting. Unless you need to light up a business, condo or common areas throughout an entire neighborhood, low voltage lighting is the way to go. LED, solar and halogens lights are your main options. So, what is the difference between them? Solar lighting systems, unsurprisingly, use solar power and provide a soft nighttime glow. Solar is definitely the easiest to install, as each unit is typically self-contained – a light with a solar panel. Two important things to consider with solar – one, it’s best for accent lighting as it’s not bright and, two, will the lights receive enough sunlight to charge fully during the day? If you want the quickest and easiest installation, solar is the way to go. LED lighting is the newest lighting option available. Just as LED lights are becoming more common for indoor lighting, they are now a popular choice for landscaping, for all the same reasons – low power consumption, bright white light, very durable, and extremely long bulb life. The downside is that, same as indoor lights, LED is more expensive up front. LED systems will have a central power bank and run on low-voltage wiring, similar to traditional halogen lights. Halogen landscape lights have been around forever and are still a solid choice for your needs. The bulbs last a fairly long time, and they are typically more affordable than LED. They do use more energy and create more heat than LED lights, and you will find yourself replacing bulbs more frequently. There are too many different types of landscape lights to cover them all here, so we want to talk more about techniques than specific light types. However, a landscape designer can guide you on the best types of lights. 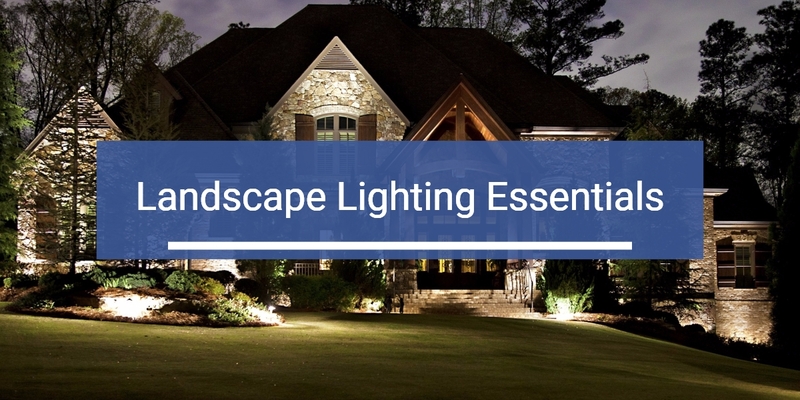 Most landscape lighting designs will use a combination of techniques. LandscapingNetwork has a great description of all the techniques you can use, but we’ll cover some of the more common ones here. When you highlight an architectural or landscape feature, that is called spotlighting or highlighting. You do this to make something really pop at night. And you want to do it sparingly, for best effect. Lighting a pathway or walkway is path lighting. This is best used for paths that are not lit by other means, like a darkened path leading to a sitting area or patio. Downlighting and uplighting are two opposites – lights either from above pointing down or lights from below pointing up. Downlighting is brighter and can be used to help illuminate doorways or other important features. Uplighting is more like mood lighting for your house – it’s subtle and enchanting. Installing landscape lighting requires a good analysis of your budget and goals. If your ambitions outweigh your budget, maybe the DIY method is best for you. But a professional can certainly help with planning and installation, especially if you want to approach the project in stages. Talking to a pro can prevent mishaps, like the need to replace your entire system when you just want to add a few more lights. Landscape lighting is a highly visible addition, and you don’t want to accidentally illuminate your neighbor’s car instead of your walkway.